When I spotted fresh shelled green peas in two of my local supermarkets recently, I was at once reminded of a pea soup I had sampled in Paris late last spring at Le St. Joseph, a restaurant located on the outskirts of the city, but definitely worth the cab ride. 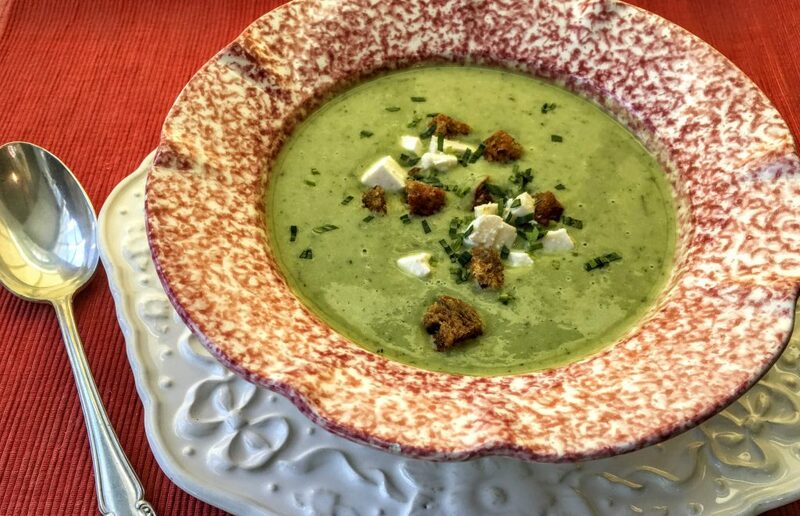 When the creamy, celadon green soup arrived at the table, it was garnished with a fine dice of snowy white feta and with crisp, golden mini- croutons. One sip of this delicious, verdant potage, and I was smitten. I polished off the bowl in less than 5 minutes. Fast forward a year to those fresh peas nestled among the sugar snaps and snow peas at the grocery. I picked up several packages to create a facsimile of the Parisian original. Sautéed leeks and tarragon make fine partners to the peas, which are simmered for a few minutes in stock, and then pureed. Some half-and- half adds a smooth finishing touch, but it is the simple garnishes that truly distinguish this dish. I sliced a block of feta into fine dice and sautéed small croutons cut from a peasant loaf until lightly browned. It took less than 15 minutes to prepare both. Offer this delectable soup as an anchor for a light spring meal. A salad of tender green oak leaf lettuce, thinly sliced cucumbers, and scallions cut on the diagonal tossed in a white wine vinaigrette, and a warm crusty baguette are all the accompaniments you’ll need. 1. For the soup, heat oil in a medium-sized pot over medium high heat. When hot, add leeks and sauté, stirring until softened, 3 to 4 minutes. (Do not let them brown). Add potatoes, peas, dried tarragon, 1/2 teaspoon salt, and several grinds of black pepper. Cook and stir 1 minute more. Then add chicken stock. Bring mixture to a simmer, reduce heat to low, and cook, uncovered, until vegetables are tender, about 15 minutes. 4. To serve, ladle soup into four bowls and garnish each serving with some croutons and diced feta and with a sprinkle of fresh chopped tarragon. Serves 4. I love this soup prepared with fresh peas, but if unavailable you can substitute 2 cups frozen peas (about 12 oz), which have been defrosted, drained, and patted dry. This entry was posted in Food News and tagged Paris, peas, soup, Spring by brosbottom. Bookmark the permalink. betty — this sounds great. I wonder how it would be chilled for a summer soup. I’ve tasted it chilled too. You’ll need to add extra salt and pepper as cold foods need extra seasoning. It also thickens a little more when it is refrigerated so you might want to thin it with extra stock or half-and-half. Let me know which way you make it. Hope you’ll enjoy this soup! Betty, you come up with “Killer” soups. I’m fixing this for company next week. I haven’t met a soup of yours that I didn’t like. It will have to be frozen peas because there jus aren’t fresh ones here in Michigan yet. Thanks for you note. I hope you’ll like this one as much as I did. I’ve made it with frozen peas and it’s still delicious! Happy Memorial Day to you!